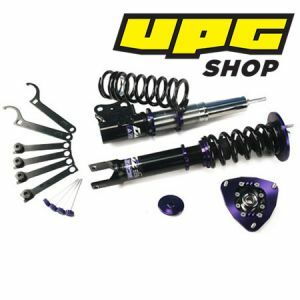 To enjoy the real drifting to the extreme, this is an excellent coilover which is different than the only ride height adjustable coilover. There are some certain rear dampers should come with helper springs to operate the sideway aggressive, ground the rear inner tire, and against with ground when drifting. The specialized rear spring rate setup can make the inside tire to press down the road without affecting the stability of vehicle. Furthermore, it accelerates the rear tires turn around to drifting handling for high-speed. There are 36 different dampening settings to meet different requirements of race-road conditions and varieties vehicles. Camber and caster can be adjusted by 3D pillowball top mount which for your options. For certain custom racing strut, D2 has right to determine to use inverted insert.